Every year, the International Documentary Festival Amsterdam (IDFA) offers many documentaries about the tragic legacy of wars and dictatorships. In The Silence of Others (2018), the crimes of the Franco regime are revealed. The Waldheim Waltz (2018) shows the historical amnesia that prevailed in Austria after the Second World War. The remarkable Chris the Swiss (2018) combines animation with archive footage and interviews as someone investigates the murder of a journalist during the war in the former Yugoslavia. For people who often go on holiday to Spain and think they know the country, The Silence of Others is a confrontational document. During and after the Spanish Civil War, many executions took place in the country. At the beginning of this documentary by Almudena Carracedo and Robert Bahar, a very elderly woman talks about such an incident and shows us the place where it happened. This is the introduction to the story of a group of victims of the dictatorship who decide to sue the perpetrators. But there is a problem. When Spain became a democracy, the parliament passed a law that granted amnesty to all perpetrators. A way to forget old crimes and start anew with a clean slate. Something that is not so easy to accept for the people who are portrayed in the film. They still want justice and more awareness of what took place during the dictatorship. A man who was tortured tells us that he lives in a street named after an officer who was known for his mass executions. The man who tortured him also walks around freely. Gradually more crimes are revealed. The regime supported a program in which children were separated from their parents and were housed with families loyal to the regime. This baby robbery appears took place on an unprecedented scale. It all happened at a time when Franco was seen as an ally in the fight against communism. Carracedo and Bahar reveal it in a fairly conventional documentary that gives unheard victims a voice and also teaches younger generations about the dictatorship. The film is not as strong as the revealing and touching films of Patricio Guzmán, who has found a unique way in the form of film essays to investigate the equally traumatic history of Chile. Yet, The Silence of Others is a necessary film that reveals many painful facts. The contaminated past of another European country is the subject of The Waldheim Waltz of Ruth Beckermann. As a politician, Kurt Waldheim of the conservative ÖVP party becomes a presidential candidate but then several rumours start to circulate in the media. Waldheim appeared to have played an important role in the Wehrmacht during the war. In Yugoslavia, he was involved in the bloody battle against partisans and he undoubtedly knew of the reprisals that took place there. He was also aware of the deportation of the Jews of Thessaloniki when he was stationed in Greece as an intelligence officer. 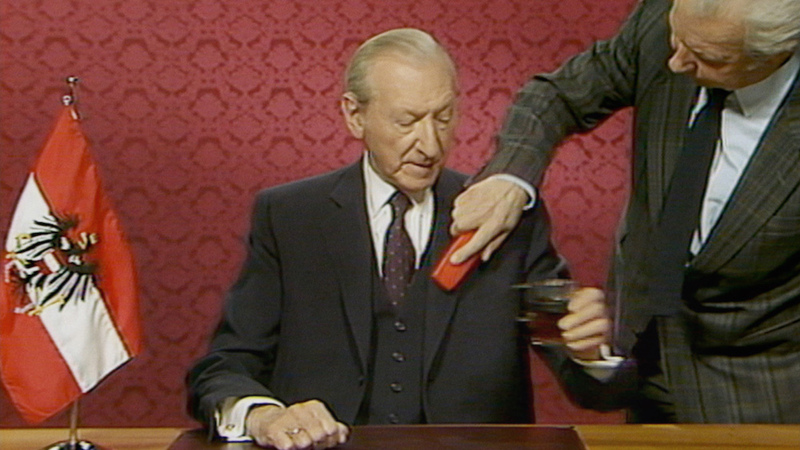 Waldheim denied that he knew anything about what was going on at the time and through archival footage, we see how people react to the accusations in Austria and abroad. Many Austrians see themselves as victims of Nazism even though many high-ranking Nazis came from the country. Antisemitic feelings also arise when the allegations are seen as a Jewish plot to destabilize the government. Beckermann protested against Waldheim candidacy at the time and her voice-over provides interesting commentary on the whole affair. She also uses a lot of television material that gives a good impression of how the media dealt with the scandal. Waldheim comes across as a sophisticated liar. A sly politician who pretends to represent the voice of the people and who wants to bring unity to a divided country. His position as Secretary General of the United Nations is also discussed. Gradually the chasm between his respectable image and his sinister past begins to grow. A painful development that becomes reinforced by Waldheim’s election victory. A cruel confirmation that just as in Spain people with power can get away with their crimes against humanity. In terms of form, Chris the Swiss (2018) is the most surprising of these documentaries. Anja Kofmels film is reminiscent of Waltz with Bashir where animation is used to portray a traumatic and war-marked past in a new way. Kofmel made the film based on her memories of her older cousin Chris. An adventurous young man who left his dull and bourgeois life in Switzerland for Africa where he would fight for the South African army in Angola and Namibia. After that, he became a journalist and he would report on the war in the former Yugoslavia. Kofmel complements her animations with talking heads and a lot of powerful archive material. Chris ended up in Zagreb and the film gives a good picture of the unreal situation in the city. Snipers would target everyone and the streets had a deadly unreal silence. Chris quickly becomes fascinated by the intricacies of the conflict when he meets a foreign journalist who decides to fight against the Serbs and forms a combat group. The war appears to attract many mercenaries and adventurers from all over Europe who join the Croats. Chris finds out that many of these soldiers have extreme right-wing sympathies and that the Catholic organization Opus Dei apparently finances them. Kofmel searches for the traces of Chris’ his last days on the basis of interviews and a trip to Croatia. She also discovers how incomprehensible his motives are. Chris is a man who, on the one hand, longs for adventure but also has a naïve attitude. That becomes clear in a conversation with a friendly Spanish journalist who was surprised that Chris said that the killing of civilians could not happen in a war. For the Spaniard, that is precisely the most important characteristic of a real war. The good thing about Kofmels film is that she offers multiple perspectives through the use of different stylistic devices. Chris the Swiss surprises and moves without forgetting to inform the viewer about a forgotten and bloody conflict that not so long ago took place in Europe. This article was originally published on Cine.nl on 22 November 2018. Does Everybody Deserve a Fair Trial?